My husband has been the military for almost 5 years now. For 4 of those years, we lived long distance from each other. He lived in the barracks in Jacksonville and I in lived in Danville, Va. Until we had our first daughter that was working great for us! We seemed to miss each other terribly but he would come home every weekend to see me and we would be inseparable for those short few days. After the arrival of Layla however, we couldn't stand to be apart. We took the impulsive decision to move me to Jacksonville and had a house with all of our things sent there within 3 days! I had to learn how to be a housewife very quickly. I was use to living with my dad and didn't have to cook or clean for that matter. Everything was a huge adjustment but I loved every minute of it! I began searching for different recipes to try. I wanted to cook him meals that he would LOVE, not just mediocre "This is good" meals. I wanted... "Oh honey! This is great! Better than my moms!". 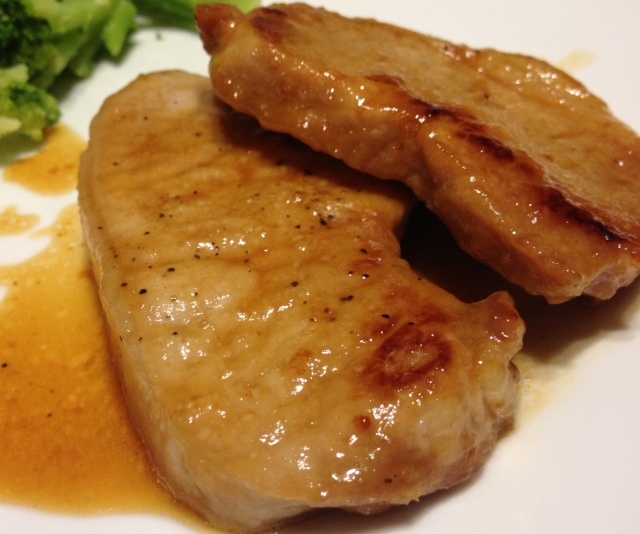 I tried all sorts of new ideas and came across a recipe using apple cider with pork chops. It sounded interesting. I had never thought apple would go well with salty pork. I wanted to try it. I looked at the ingredients and I was missing a few things so I decided to make my own recipe. Finally I got a response out of the hubby! He loved these Apple Juice Pork Chops! He even said he wanted it to be a weekly thing and never wanted to use Shake & Bake ever again! chops and let cook for about 5 minutes. simmer and sit for about 10 - 20 minutes until the mixture thickens to a syrup. - Add the pork chops and cook until done covering the chops in the syrup glaze. OPTION: Caramelize a few apple slices in the glaze and add on top of your pork chops.